It is a social business network in which, through the sharing of knowledge and experience, social and professional relationships of its members are empowered, turning them into countless business opportunities. wind2share announces the launching of its innovative web platform on November 16, at the Private Banking Latin American Forum, taking place at the Four Seasons Hotel in Miami. wind2share has signed agreements with multiple world class institutions that offer their expertise and knowledge to its members. Members then convey the messages to their related interested persons, who will be the ones establishing a business relationship with said institutions. “wind2share is a public relations network, designed for referring business opportunities; a social network for sharing knowledge and expertise,” said Alejandro Riquezes. The interaction among institutions and members is vital for the success of the network. Wind2share allows its members to see and interact with all participating institutions and other members in a comfortable and effective way, enhancing the business opportunities among them. wind2share is the result of its founders combining expertise in private and investment banking, as well as business development, technology and social media. 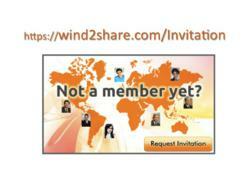 wind2share, was founded 3 years ago in Boca Raton, Florida, and is currently present in over 20 countries.